We offer a fully guided trip in some of the most beautiful lakes that God has ever made. Our guide service is located in the Southern Arkansas. The trips are kid friendly. We offer a great experience for you, your friends and family. We will do whatever it takes to make your experience one that will be remembered for a lifetime. Your trip, should you chose to take it, will consist of 8 hours of action packed catfish grabbin. Everything you need is supplied except for the nerves to reach in. I've been guiding for a few years now and have never had a day where we haven't brought in fish... EVER. You can see me on Struttinbuck Outdoors, the "Gut Check" episode. And we will be on Catfishin' Kings on the Animal Planet in March of 2013. Are you ready to get bit by some of the meanest catfish in the state? Rates are $200 per day, per person. Go to the website for more information and to get your day set up, before somebody else takes your spot. Join in and write your own page! It's easy to do. How? 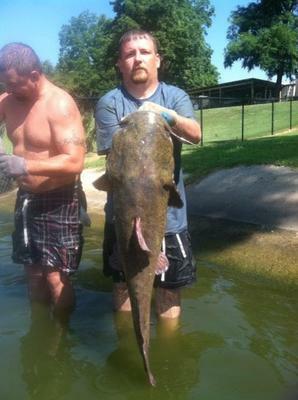 Simply click here to return to Noodling For Catfish.